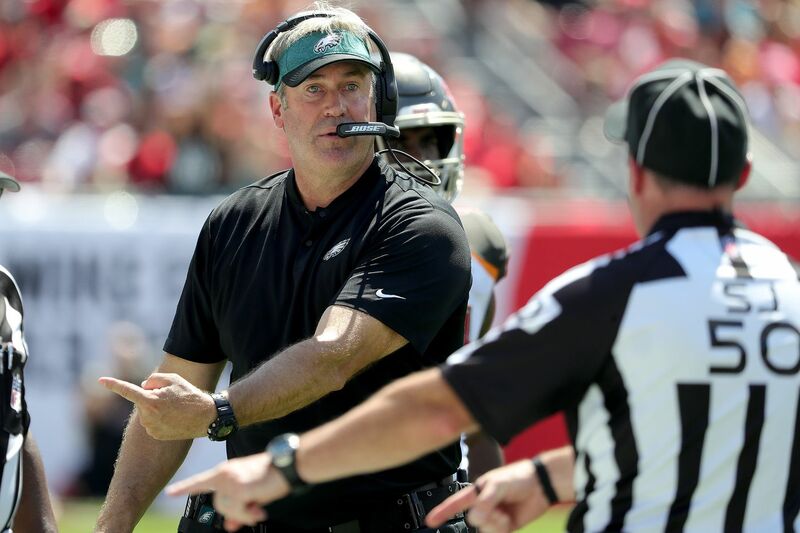 Eagles head coach Doug Pederson talks to the officials during the second quarter. The Eagles lost to the Bucs, 27-21, on Sunday in Tampa. Here are some quick highlights from Eagles coach Doug Pederson and quarterback Nick Foles' postgame press conferences. A lot of disappointed guys, quite honestly. A lot of self-inflicted wounds today. Obviously we got beat, we've got to take the loss and we've got to learn from it. But you know, I try to preach to our guys that a lot of times it's our execution, it's what we do that really matters, and we weren't successful in that area today. So, a lot of dejected players. But there's a lot of football left and we'll get it fixed the next couple of days and get ready for next week. I was going for it anyway, regardless of percentages. We were plus-50 [across midfield] and I was going for it. I felt we had a little momentum on that drive, and I felt confident that we were going to get the first down. So I was going for that one. *Pederson took a deep breath as he tried to remember the play, then shrugged* I think I felt like the defense was going to be soft, cover-two-ish and a five-man box, and a chance to maybe break a run. I guess. That answer your question? Okay. Alright. I'll talk about that later this week. We gave ourselves as a team an opportunity to win this game. And that's the only thing you can do in this league. Obviously, we want everyone healthy, but that's not really the case sometimes. This is a physical sport. Things happen. So that's where the next guy has to come in and do his job to the best of his ability. And I thought our guys stepped up today. We gave ourselves an opportunity to win. We have to clean up a lot of the penalties and execution errors. But we will continue to do that. It's my job. I've played this game a long time. You're not always going to have everyone healthy. That's just part of this game. I don't really focus on that. I focus on going out there, stepping in the huddle [and] whoever's in the huddle, I trust them. We've got to get the job done. There's a lot of guys that were injured this game, there's a lot of guys that banged up, but we kept fighting and that's what I'm going to focus on. I didn't get an explanation. They made the best decision. It was probably just not enough to overturn. I felt when I was throwing it, my arm was going forward but watching on the screen, right when my arm is going forward the ball comes out weird. That happens when you're getting hit from behind.